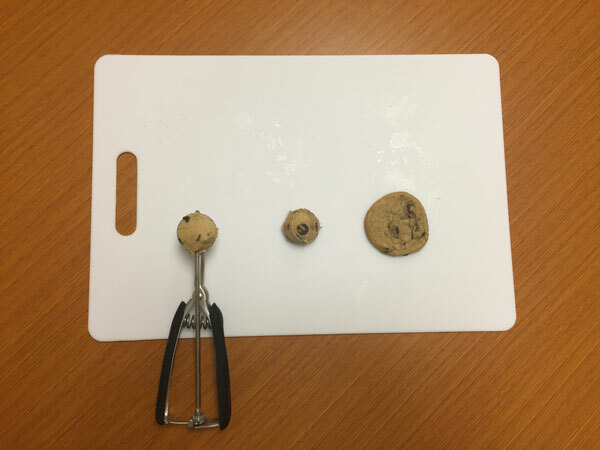 There is no universal size for a perfect cookie. 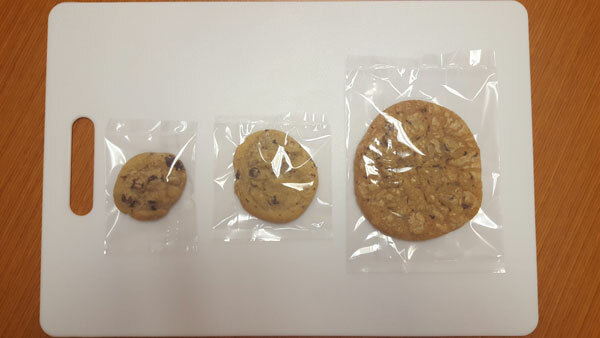 Some cookies are bite size, some are “average” size and some take two hands to hold. No matter the size, one thing is for sure, cookies sure are tasty. Most bakers have their favorite cookie recipe, secret ingredients and the perfect “scoop” size. Cookie scoops come in many shapes and sizes. 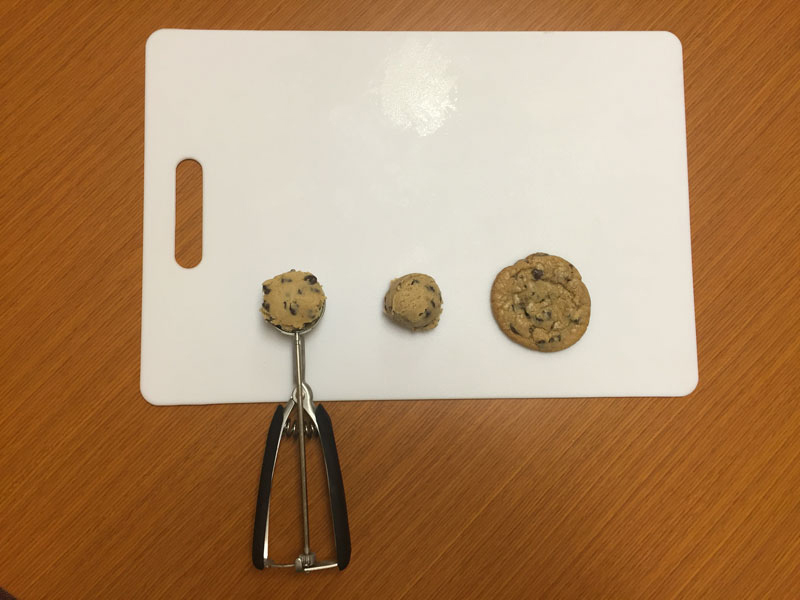 The size of each scoop determines how big the cookie will be. 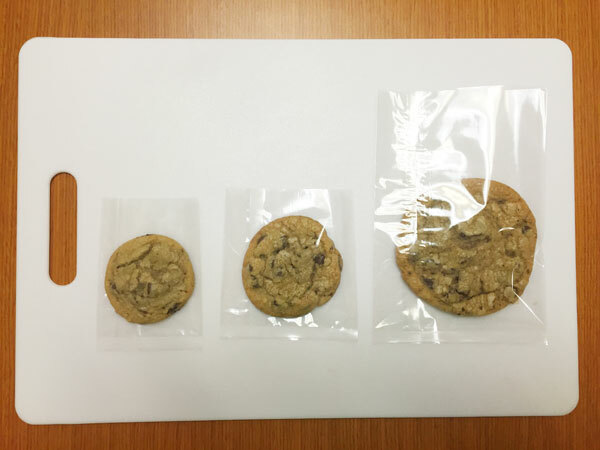 We wanted to test out some cookie scoop sizes to truly find out how big each cookie becomes and what bags work best to package them. 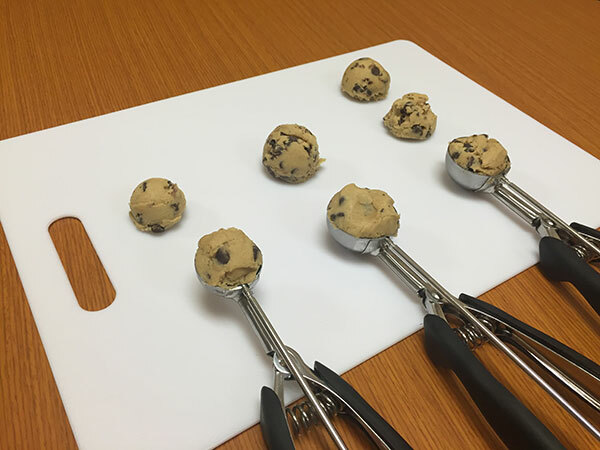 A small cookie scoop fits about 2 teaspoons of dough, a medium scoop fits about 1 ½ tablespoons of dough, while a large scoops fits about 3 tablespoons of dough. 1 small cookie scoop is about .75 oz of dough and makes a 2” cookie. 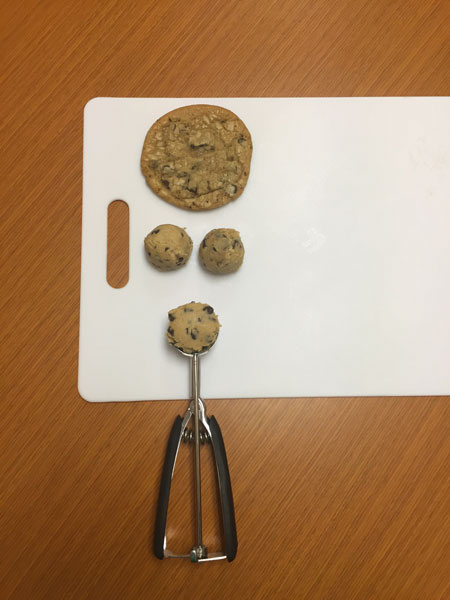 1 medium cookie scoop is about 1 ¼ oz of dough and makes a 3” cookie. 1 large cookie scoop is about 2 ¼ oz of dough and makes a 4” cookie. Please remember that these sizes and measurements change slightly with each recipe and the ingredients used. Some cookies spread out and stay thin, while others get puffy and thick. The measurements listed here are based on a standard chocolate chip cookie recipe. Now the fun part, where ClearBags comes in… packaging! (Yes, we are huge packaging nerds). You just baked these amazing cookies, now you want to give them to friends or family, or sell them at your shop. We really like the flat bag option, though we have tons of food safe packaging options for cookies and other baked goods. To keep that freshness locked in, you can heat seal these flat heat seal bags with an impulse sealer. Do you have really gooey cookies that can bend and break? Try a paper board insert or grease resistant cookie card. These inserts are a great way to provide a little extra support to your cookie to help keep it from breaking while on display. 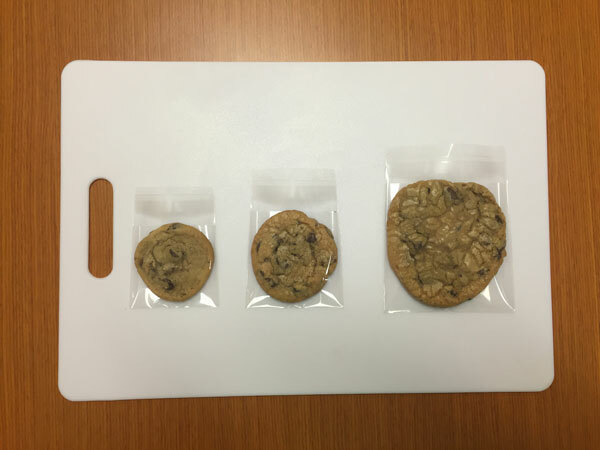 You can just slide your cookie onto the insert and then into the outer bag for a completed packaging look. 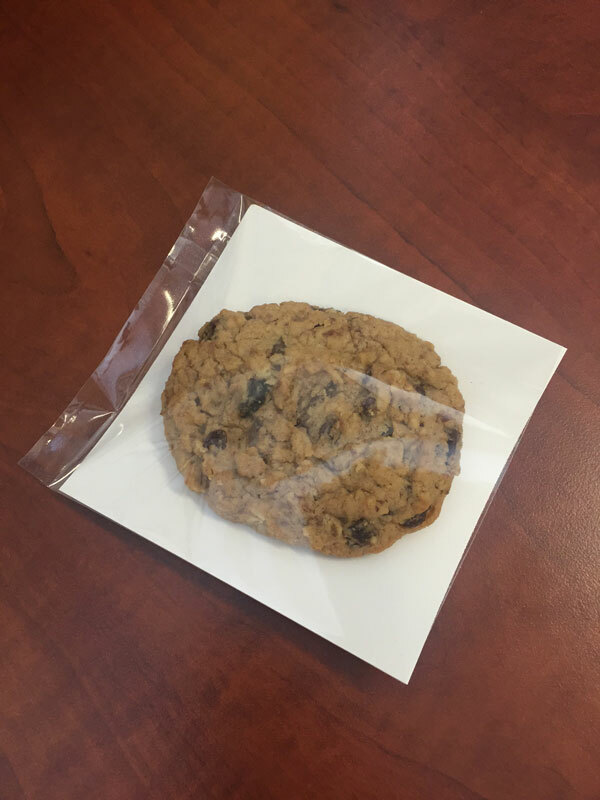 Grease resistant paper board inserts, or cookie cards as they are known, can be custom ordered on our ClearBags website. You can also cut down a standard cake board to use as backing, but that is only an option to those that do small quantities. 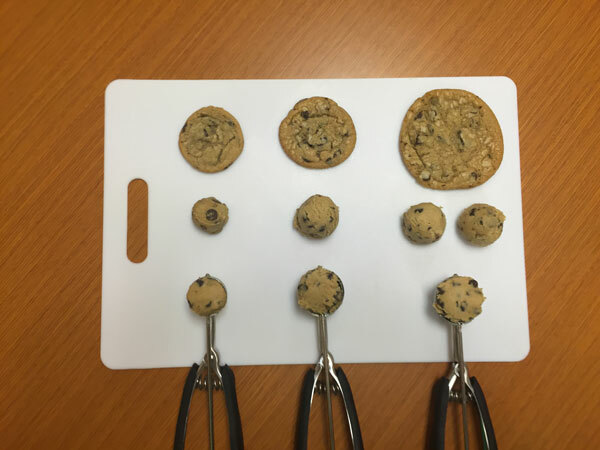 So whether you are making bite size cookies or colossal cookies, no matter how big the scoop, flat bags are a great option. For more ideas on how to package your cookie creations, please check out our post about cookie packaging or head straight over to our cookie packaging page! Next time you whip up your favorite batch of cookies, feel free to share a picture of them with us on Instagram or on Facebook.